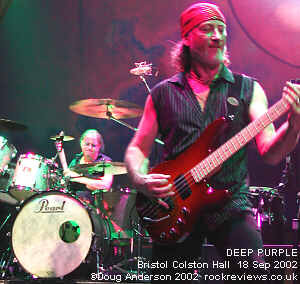 February saw Deep Purple return to the UK with some of their strongest shows both material and playing wise since they reformed in 1984. Unfortunately that tour was cut short due to the band, vocalist Ian Gillan in particular, coming down with flu. Since then Hammond master Jon Lord has retired to be replaced by Don Airey, a man with more than a few Purple connections. Bristol was the penultimate show of the rescheduled dates, delayed this long due to Russian and American tours. With six months touring under their belt the new line-up was tight and they had shortened and switched the set around to fit into the three-band bill, Dio and the Scorpions, in the US. This set was pretty much what they presented to us during September. 'Fireball' proved a powerful opener and highlighted Roger Glovers bass while the double-barreled attack of 'Woman From Tokyo' and 'Mary Long' explored the underrated Who Do We Think We Are album. As you may gather the 70's heyday formed the basis of the set and apart from 'Ted the Mechanic' plus an instrumental that may make the next album the Steve Morse (guitarist for the last nine years) era was sadly ignored. While Abandon may not have been a great album it would have been nice to hear at least one track from it and I'm sure people that read reviews of the February tour missed 'The Aviator' from Purpendicular. Much of the rest of the show followed the usual Made In Japan setlist and despite a fresh lick of paint from Don I'm afraid the safe option disappointed a little. Things picked up after the keyboard solo as, following some classical licks and a touch of the Star Wars theme, the lights dimmed for a few seconds. When they faded back up both the sound and keyboard player had changed for 'Perfect Strangers' - Jon Lord returning for half a set as his farewell to the fans. The response that erupted from the audience must have made him wonder if retirement would be so satisfying. From there to the encore it was classics all the way with just a short drum solo from Ian Paice breaking the momentum. The climactic 'Smoke on the Water' featured a surprise in the form of Bernie Marsden coming on to swap riffs with Steve while Ian Gillan mounted the keyboard riser to entice Jon and Don to join in with him for the chorus. A three track encore ignored chat and powered straight through hit singles 'Hush' and 'Black Night' while the rocketing 'Highway Star' provided a high octane finale to what can only be described as a rocking good show. While older fans such as myself may well have preferred a little more variety in the set any young converts (and there were plenty of them at the show) could go home happy in the knowledge that they'd experienced most of the classics played as well as I've seen. Deep Purple can still hit the mark and with an almost completely sold out tour the fans still desire their band of classic rock.